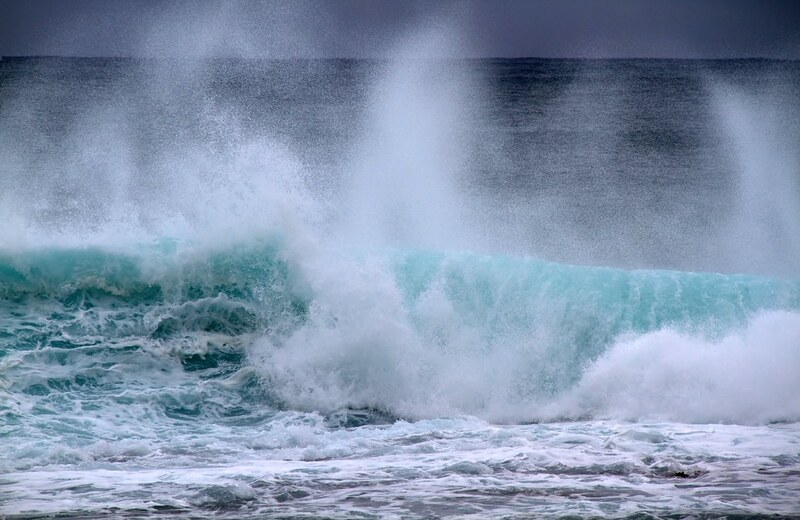 Ocean biology alters the chemical composition of sea spray in ways that influence its ability to form clouds over the ocean. That's the conclusion of a team of scientists using a new approach to study tiny atmospheric particles called aerosols that can influence climate by absorbing or reflecting sunlight and seeding clouds. By engineering breaking waves of natural ocean water under purified air in the lab, they were able to isolate and analyze aerosols from the spray and determine how life within the water altered the chemistry of the particles. "After many decades of attempting to understand how the ocean impacts the atmosphere and clouds above it, it became clear a new approach was needed to investigate the complex ocean-atmosphere system. Moving the chemical complexity of the ocean to the laboratory represented a major advance that will enable many new studies to be performed," said Kimberly Prather, Distinguished Chair in Atmospheric Chemistry at the University of California, San Diego and director of the Center for Aerosol Impacts on Climate and the Environment, who led the team of more than 30 scientists involved in this project. They report their findings in the early, online edition of the Proceedings of the National Academy of Sciences the week of April 22. Tiny air bubbles form in the ocean when waves break, then rise to the surface and burst, releasing gases and aerosols into the atmosphere. Sea spray aerosols come in a wide variety of sizes and shapes with chemical complexity ranging from simple salts to complex biological mixtures to bacterial cells. For decades, scientists have been studying how the chemical make-up of aerosols affects their ability to take up water, seed clouds, and react in the atmosphere. Because aerosols from other sources overwhelm field measurements, it's been difficult to isolate and study marine aerosols over the actual ocean. "Once the ocean-atmosphere system was isolated, we could systematically probe how changes in the seawater due to biological activity affect the composition and climate properties of the sea spray aerosol," said Prather, a professor in the Department of Chemistry and Biochemistry who holds a joint appointment at Scripps Institution of Oceanography. They pumped seawater directly from the Pacific Ocean into a specially modified enclosed wave flume in the Hydraulics Laboratory at Scripps Oceanography. By stringently filtering the air within the wave chamber, the team eliminated contamination from other sources allowing them to probe sea spray aerosol directly for the first time right after it was produced by breaking waves. Over five days, the team systematically altered biological communities within the flume by adding various combinations of cultures of marine bacteria and microscopic marine algae, or phytoplankton. Then, as a hydraulic paddle sent waves breaking over an artificial shoal, instruments positioned along the 33 meter long flume analyzed the chemistry of the seawater, air, and aerosols. As the seawater changed and bacteria levels increased, the composition of the aerosols changed in ways that reduced their ability to form clouds. In particular, a day after new cultures were added, bacteria levels rose fivefold and cloud-seeding potential fell by about a third. These changes happened even as the concentration of phytoplankton fell, along with levels of chlorophyll-a, the pigment essential to photosynthesis. This is an important finding because current estimates of biological activity in surface waters of the ocean rely on instruments aboard satellites that measure the color of the sea surface, which changes along with levels of chlorophyll-a, an assessment that will miss blooms of other organisms, such as bacteria. The findings demonstrate the value of the center's novel approach for sorting through the interdependent factors governing the effects of the ocean and sea spray on climate.